Instructions on inserting/removing your SIM can help with activation issues/errors, browser connection problems and a blank/frozen screen. 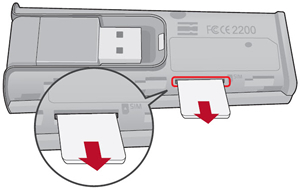 Don't attempt to remove the SIM card while the device is powered on. Doing so may harm the SIM card and/or the device. Don't modify or alter your SIM card. Refer to these additional 4G SIM card do's and don'ts. Ensure that the device is disconnected from the computer. Press down and slide then detach the cover. Press in then remove the SIM card. If applicable, refer to Insert the SIM Card.